Assignment 4 gathers a number of topics together in a right-sized piece of work. It is VERY IMPORTANT to submit your work before the due date and time. This assignment CANNOT be late. If it is not submitted by the due date and time, your Assignment 4 grade will be zero. Grading will begin the morning after the submission date and time. 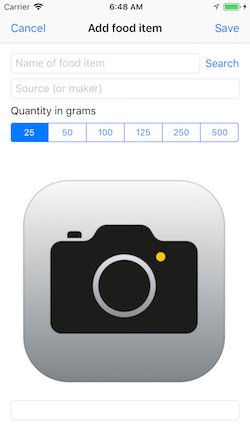 We need an app that will enable you to capture and store information about the food you eat during the day. It is important for everyone to have good nutrition habits. Diet and nutrition issues are too easy for people to ignore and dismiss as unimportant, but good food brings health, both in body and in mind. Modern society and culture have increased interest in food and health, so an app like this could be useful. Use the TemplateCDv1 as a base - it’s in the course’s code repository, in the templates and solutions folder. Follow its how-to instructions in the “read me” document. At this point, the app will load and run correctly, and enable you to create and delete “example” entity objects. These objects are persisted in a Core Data store. All the base / infrastructure programming bits are provided in the template. Build and run (and test) frequently. Do these tasks incrementally, so that you build upon success and do not leave problems behind. The photo attribute should be configured as shown in the following image. The “allows external storage” feature that enables efficient storage of large binary data objects. For some combination of large-size objects and/or a large number of these objects will cause Core Data to use the file system if it improves performance. Just set it, and the Core Data engine will take care of the rest. After you complete this Core Data model editor work, Xcode will generate, and make available to your code, a class named FoodItem. If you have followed the “how to use” document, then the ExampleList controller and storyboard scenes were deleted. Therefore, we need a controller to show food items. If it helps, follow the guidance to create a controller and scene to view the list of food items. This scene and controller enables the user to view the info about an existing food item. It is a “next” scene in a drill-down navigation flow from the list scene. On the list scene, the user taps one of the rows, and this info/view controller slides in from the right, to show the item’s details in some combination of labels, images, or whatever’s appropriate for the item’s data. In the template, the ExampleSceneBaseCD.swift source code file can be duplicated and edited to fulfill this task. On the storyboard, the segue will be a standard “show” segue, and in the controller, it will use the “workflow” segue code block. The app does not yet have data, so it won’t be possible to view this controller’s scene until you complete the work in the next section. This scene and controller enables the user to add a new food item to the list. As you have done before, this feature is presented by the list controller, via an “Add” + button in the right-side area of the top-of-list nav item. If it helps, follow the guidance to create a controller and scene to add data about a food item. Add user interface controls for all except photo. The first three controls should be standard text fields. At your option, you can use a larger text view for the “notes” data. The selectedSegmentIndex property has the tapped/touched segment. The titleForSegment(at:) method has the text title for a segment index. You can convert that text to the number that you need. 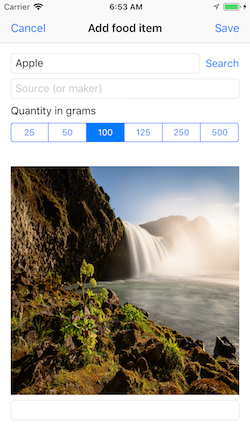 Do the work that enables the app’s user to create food items by providing input for name, source, notes, and quantity. Don’t worry about storing unwanted data - you can delete it later - the goal at this point is to save something. For the timestamp, get the current date-and-time before saving the new item. Again, don’t worry about storing data that you will want to delete eventually. Remember, when you delete an app, all of its data is deleted too, so an easy way to clear all data is to delete the app from the simulator or your device. Alternatively, if you did the “add list controller” task successfully (above), the table view “delete” task should work correctly, and enable you to delete items one at a time. 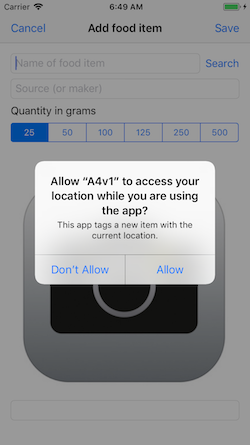 As you recently learned, location services is a device feature that needs the user’s permission. It is also a feature that works in an asynchronous manner, so we must be prepared for that. The controller must conform to a protocol, and implement the delegate methods that handle the location update events sent by the iOS runtime. The “add new” controller is an ideal place for the location services code. The scene’s text fields will gather input from the app user, and it will take a small amount of time to do that. If we activate location services when the controller and scene becomes active, the location update events will be complete when the app user is ready to save the new item. The egLocation code example in the course’s code repository has the essential info needed to understand and use location services. Add and/or write the code needed in the FoodItemAdd controller class. Make sure that the location data (latitude, longitude, and address) are saved with the new food item. Remember to go back to the food item info/view controller and scene, and add in the location-related code. As you recently learned, using the camera and/or the photo library is a device feature that needs the user’s permission. It is also a feature that uses a built in “picker” controller, that works the same as our “add new” and “show details” controllers. In other words, the presenting controller must conform to a protocol, implement some delegate methods, and the camera/photo picker scene slides up from the bottom. As mentioned above, the picker controller is built in, so we do not have to write code for it, but we must write code for the picker’s delegate methods. These methods are called by the iOS runtime when the user interacts with the picker (e.g. take photo with the camera, select photo from the library, or cancel). Our initial goal is to get and display a photo. The user interface will include a button that presents the picker, and an image view that shows the photo. Edit the scene. 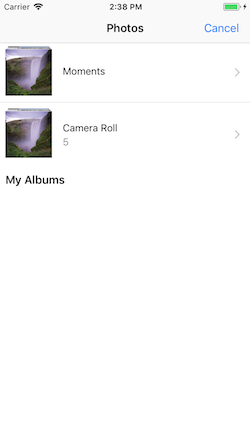 Add a button that will begin the photo take/pick action. Locate and import suitable icon/image to the asset catalog; maybe a web search can help with this task. On the button’s attributes inspector, change the “Type” to “Custom”. Then, in the “Image” dropdown list, select the icon/image that you imported. From the button, create an action connection to the controller code. 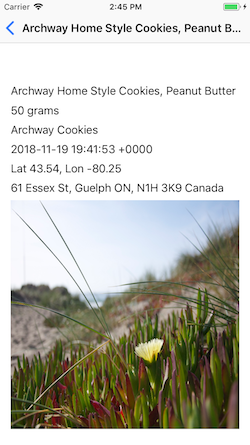 Add an image view that can display a photo. Create an outlet connection to the controller code. The egCamera code example in the course’s code repository has the essential info needed to understand and use the camera and photo library. Add and/or write the code needed in the FoodItemAdd controller class. Make sure that the photo data is saved with the new food item. How? errorMessage.text = "Cannot save photo"
Remember to go back to the food item info/view controller and scene, and add in the photo-related code. 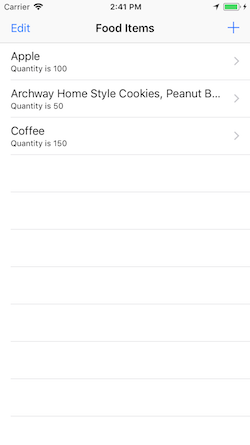 At this point in time, your app should be able to show a list of food items, enable the viewing of any one of them, and enable the creation of new fully-configured food items. The suggested plan or strategy is to 1) create an item-selection controller and use in-memory data items to select among, and then 2) adapt it to use data items fetched from a web API. In our app, we need a way to select an item. What item? Something from a list of search results. This is a common task in apps. All students will be familar with the use of select and option elements in HTML, and how they are used to make a list of items. On a web page, we typically see this kind of feature as a “list box” or a “dropdown list”, as shown in the web page example, below left. 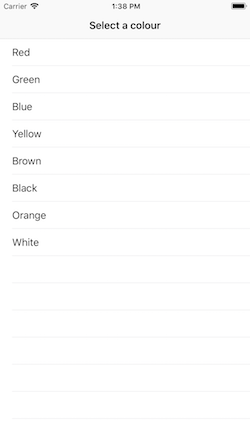 A similar example has been prepared for a list (table view controller) scene in an iOS app, as shown below right. How can we do this for our app? There are several ideas involved. The egSelect code example in the course’s code repository has the essential info needed to understand and use an item-selection list. As noted above, we suggest that you first implement the item-selection controller with in-memory data items. (For example, create an array of strings in the controller’s viewDidLoad() method.) When a user taps a row, pass the data back to the presenting controller (in the delegate method call). Earlier, on the “add new” scene, you probably configured your food item name text field to span the full width of the scene. We suggest that you reduce its size so that you can fit a “search” button to its right. The button will cause an action segue to show the item-selection controller. How do we handle #6 above (do something with the passed-back data)? Well, in the “add new” (presenting) controller, implement the searchTask(_:didSelect:) delegate method. The type of the passed-back data is a string. Set the food item name text field to show the passed-back data. 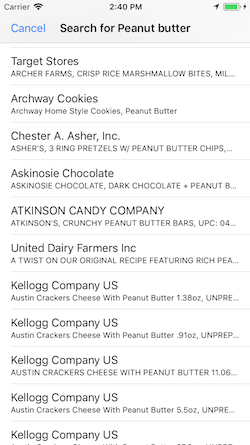 At this point, your app should be able to enable the user to add a new food item by entering its name in the text field, or by using the item-selection controller. This will be a lengthy task, partly because you will be learning a number of techniques. We suggest that you read/skim the content below before doing the work, so that you will know what’s coming. The “egWebApiGet” code example in the course’s code repository has the essential info needed to understand and use the network. Your professor has created a class - WebApiRequest - that improves the process of working with a web API. One of the problems in this topic area is the wide and variable number of so-called “best practice” approaches. The problem is that many of them are NOT scalable, and/or repeatable, and/or adaptable. Add the WebApiRequest.swift source code file to your project. Later, you will make a few minor edits to the code. The other files can be used as guidance only, and/or copy-code sources. Do NOT replace your existing manager and data model classes source code files. For this project, we will work with the United States Department of Agriculture Food Composition Databases web API. Yes, there are many other data sources, but this will meet the needs of this project very nicely. Near the middle of the page, there is a “Gaining Access” section. Follow its instructions. You can use a College or personal email address. It will send the “API key” to your email address. Other key-value pairs can be added, and they are documented on the page linked above. A commonly-used pair - max=25 - will limit the number of returned results to the value provided (i.e. 25 items). Here are some example queries (which can be sent in a browser; replace “YOUR_API_KEY” with your “API key”). Notice that multi-word search terms are encoded (in other words, the space has been encoded as %20) Multi-word search terms are treated as “and” situations, and will return results that include all words (or synonyms/equivalents). Make sure that you are comfortable with the interaction pattern. It is essential that you have some experience doing this BEFORE you begin coding it into an iOS app. Carefully study the responses to your queries. Your task in this section is to design and define structs that match the shape of the response data. There’s no magic shortcut that makes this process easier. Take your time, be careful, and when you are able to test the request in your app, pay attention to any error messages that appear in the debug console area. The outer package is an object, and has ONE key-value pair, “list”. The value of “list” is an object. Some of the values of the “list” object are strings, and others are numbers. The “list” object has a key named “item”, and its value is an array (collection). The contents of the array is a collection of objects. Each “item” object has the data we need for our app, specifically the values of “name” and “manu”. The next task is to create a property (instance variable) in the manager class, to hold the response from the web API request. As you learned above and from inspecting the response, it is an object of type NdbSearchPackage (if you used the suggested struct names from above). Declare the object property as optional. Note that in a different situation, if the response is an array/collection, then the property declaration must be declared as an empty array of the appropriate type. Follow the guidance and suggested code patterns in the “egWebApiGet” code example. Wait - we want a collection of items, to show in an item-selection list, right? Why are we declaring and using an object property? In this section, we will adapt the add-item controller and the item-selection controller to use the search results collection that’s stored in the manager. We want to prevent a segue if the food item name text field is empty. However, if it’s not empty, we want to execute the search task. The design of the prepare(for:sender:) segue method does not permit us to cancel it. In other words, when the method gets called, it will execute. However, we do have another method - shouldPerformSegue(withIdentifier:sender:) - that the iOS runtime calls just before prepare(for:sender:). This is ideal, because we now have a way to prevent a segue. The shouldPerformSegue(withIdentifier:sender:) method returns true or false. That is how we can control whether the iOS runtime calls prepare(for:sender:). Now, move on to the item-selection controller. Its viewDidLoad() method needs the statement that will observe (listen for) the notification that the manager posts when the fetched web API data is ready. Use the pattern you see in either “list” controller in the “egWebApiGet” code example. After adding the statement, it tells you that it needs the reloadTableView() method. Write (copy) that too (it simply reloads the table view). The number of rows in the data source must be updated. The new data source is (obviously) the property in the manager that holds the web API response. The cell content must be updated. We suggest that you change (on the storyboard) the table view cell style to “Subtitle” to show both the food item name and its source (“manu”). The tableView(_:didSelectRowAt:) method must be updated. Extract the data-item from the data source, and pass that back to the delegate method. 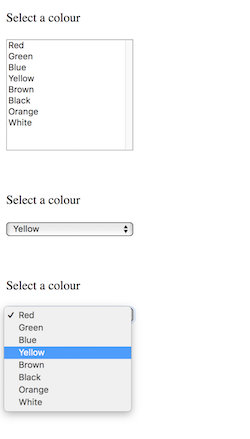 At this point in time, the item-selection process should be working with the web API. If you have time, it would be nice to do a few things to improve the appearance of some parts of the app. It would be useful, to the app user, to show the taken/picked photo on the button that’s on the “add new” scene. This task is easy to do. In the imagePickerController(_:didFinishPickingMediaWithInfo:) method, add another statement to set the image property of the button. The latitude and longitude values typically show many decimal digits, maybe too many. It would be nice to limit the number of decimal digits, maybe 4, to ensure user interface consistency when different food items are viewed. This task is easy to do, and is similar to C/C++-style formatters. Date formatting in Swift can initially appear to be annoying, but it is actually pretty good in more complex scenarios and whenever you must consider internationalization of the app. Then, we use the object’s string(from:) method, and pass in the date. The method returns a string, which can be used in the user interface. The in-memory or storage size of a photo can be huge, a few megabytes or more. It would be nice to have a “thumbnail” image, which could then be used as the image property in a list scene. Get the “UIImage+Thumbnail.swift” source code file from the templates and solutions folder of the course’s code repository. Add it to your project. This extension has a method that can be called on any instance of UIImage. Read its source code comments for more details. In the “add new” controller, add more code to the item-save block. There is existing code for photo handling. Add the new code under that. Create a new image thumbnail (suggested size is 25.0). 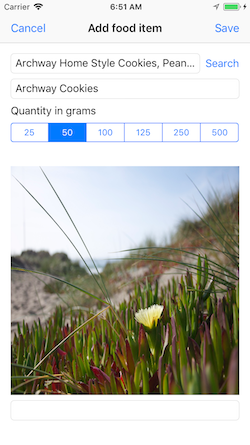 In the “list” controller, in the cell building method, add code that sets the cell’s imageView.image property to the thumbnail (if it exists). Right-click the project folder, and choose Compress “xxxxxxxx”, which creates a zip file.